ImTOO iPod Computer Transfer also allows you to connect several iPods and other iOS devices and manage them simultaneously. Transfer songs, movies from iPod to iPod, iPod to iPhone and vice versa. It even offers you the ability to manage your iPhone as a portable hard disk. All iPod, iPhone models and generations and iTunes versions are supported. 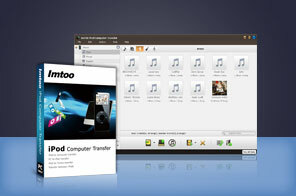 Transfer music, video and other files between iPod and computer for backup. Sync, copy and backup songs, movies and other multimedia files from iPod to iTunes 12. Connect several iPods without conflict or slowing down your computer; copy and share files between them without overwriting each other's information. Support all generations and versions of iPod, iPhone and any version of iTunes. Use iPhone as a portable hard disk to import/export files and contents to/from computer. Drag and drop application between PC and iPad, also support to manage application document. Manage iPod on any computer with this iPod to Computer Transfer installed on your PC. Create, deleted and edit photo albums to organize your iPod photos conveniently. Read and export videos/photos shot by the device conveniently. Share one photo with multiple albums for your different needs. Search and filter through files easily. Displays device properties such as model, capacity, version, serial number and the like. View files in multiple modes including songs, albums, artists and genres. Select from French, Italian, Spanish, German, Japanese, Chinese language interface.